1. People (namely, us) are pretty angry about this Facebook Ads Manager update – let the rant commence! Facebook Ads Manager updates are usually good news. A bug fix, a cool new feature, an enhanced experience. But an announcement this week has left us far from happy. I wouldn’t be surprised if a bunch of advanced advertisers out there feel the same. So here’s the problem: Facebook has officially stated that all ad budgets will be managed at campaign level from September 2019 – meaning no more ad set budgets and much less control for advertisers. Some people might have no issue at all with this, especially if they’re running with a relatively straightforward ad strategy. But (as you have probably already noticed) we do have an issue with it. The update essentially means Facebook will automatically distribute budget between all ad sets in a campaign. The idea being that it optimises and reassigns budget constantly based on what’s working best, to get you the most results for your money. Sounds good, right? But in our experience it can be a huge let down. Being able to define budgets at ad set level means it’s super easy to organise budgets and ads. You can make sure all ads sets (e.g. separate ones for Facebook and Instagram, different sales funnel tiers or a variety of regions) get enough money spent on them. Being forced to set budgets at campaign level means Facebook will decide where best to allocate spend in terms of ad sets. And we’ve found time and time again that it massively underserves some and massively overserves others (usually Facebook). 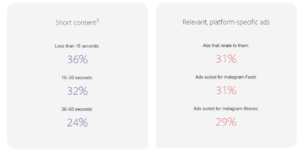 We regularly see Instagram ad sets, for example, getting less than £0.10 spend. Not helpful when Instagram is a priority platform. Plus, you don’t necessarily always want your ad sets prioritised by lowest cost per result. We all know that reaching higher quality or niche audiences can be more expensive – and this is something Facebook optimisation seemingly fails to take into account. So what’s the solution? If you want to retain a tight grip on your budgets and sales funnel, it might be a case of having to separate different targeting into campaigns as opposed to ad sets… but we can already see this getting seriously messy in terms of overview and analysis. We’ll keep you updated as we figure this one out. 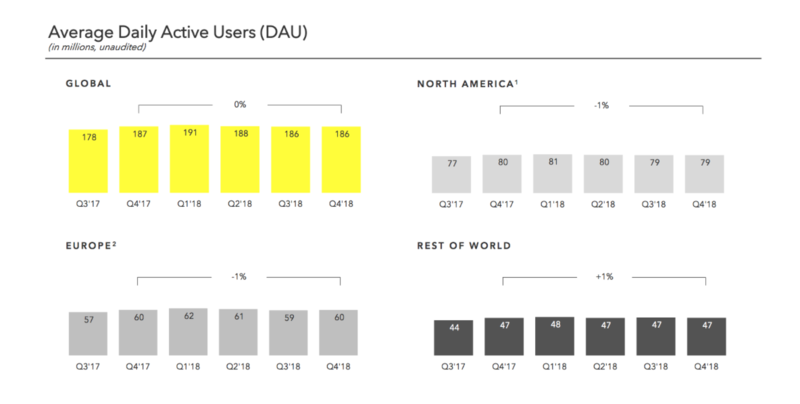 something must have been in the air at the end of 2018 because now we have another positive Q4 report, this time from Snapchat. Snapchat has long been suffering under the weight of Instagram. And while it’s still not technically gaining users, it has – importantly – stopped losing them. This is a significant moment because the user base was steadily declining over the course of 2018, falling from 191 million daily active users (DAUs) in Q1 to 186 million in Q3, a number that was maintained in Q4. As you can see, even though this is positive, it’s a slight decrease year over year. The release of these results had an immediate impact on share prices, which have jumped 17%+ to over $8. While this is still way lower than the $20 seen this time last year, it’s the highest price since late September 2018. The folks over at Facebook’s insight unit, Facebook IQ, recently conducted two studies to learn more about how users relate to brands on Instagram. Both studies involved people from many countries to get a more global perspective. The first was qualitative and involved hour-long interviews with 70 people from a range of age brackets. 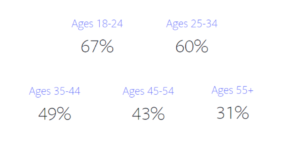 This data led to a second, quantitative survey of 24,000 people aged 13-64 who use Instagram at least once a week. While we (and I’m sure many of you) spend a whole load of time analysing our clients’ post and page performance on Instagram, it’s always interesting to add to engagement data with a more in-depth understanding of users’ attitudes towards brands. So how do users feel about brands? What do they expect from a business on Instagram? Takeaway for marketers: users are in it for the long haul, are you? Takeaway for marketers: this is really simple: if you want to resonate with your Instagram audience, you need to create content and ads specifically designed and optimised for the platform – users notice and will respond. This is a quick one but a really good one. I remember rumours of this a while ago and now it’s finally happening. Facebook is getting ready to release a unified inbox within Facebook Pages Manager, which will – wait for it – include Instagram Direct messages. Until now, page owners could view messages from Facebook Messenger as well as post comments from both Facebook and Instagram. Instagram Direct messages have been missing, much to the annoyance of social media managers everywhere. But it looks like that’s about to change and DMs will be added into the mix. This will mean you can do all your community management (at least for Facebook and Instagram) in one place. This is especially interesting in light of the huge news from a couple of weeks ago that Facebook is planning to merge the messaging aspects of Facebook, Instagram and WhatsApp. When it comes to Instagram Stories stickers, we’re not short on options. You can already add countdowns, questions, sliders, polls, hashtags, music and more to your Stories – and to be honest, they’re all worth playing around with. While you might find some much more valuable than others, each creates a new opportunity for fun interactions with your audience. The latest to the line-up is rumoured to be quiz stickers. The new addition was initially spotted in testing over a year ago by WABetaInfo, and has now been seen again by seasoned new-feature-spotter Jane Manchun Wong. This could be a really cool way for brands to connect with audiences. Not only does it give fans the chance to select an option (like the poll) but has the additional engagement layer of also providing an answer. I can already think of tons of fun ways to gamify this and integrate it into campaigns, so let’s hope it arrives soon.